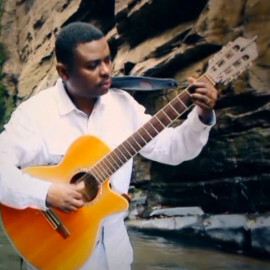 Jean-René specializes in music traditions from the Democratic Republic of the Congo. He has toured extensively in Europe and the US with the band Bomoyi, performing his original compositions based on a blend of Congolese Rumba and Gospel styles. He holds a bachelors degree in music from the National Institute of Arts, Kinshasa, Democratic Republic of the Congo. He taught songwriting and choral classes there as well. In addition to his areas of specialization, Jean-René is comfortable with teaching various styles of popular music on voice and guitar. Locally, he is currently the choir instructor at the Campus Middle School for Girls. He has taught, performed, and collaborated with Krannert Center, Spurlock Musuem, University YMCA, the Urbana Free Library, numerous area churches, and local elementary schools. Jean-René is committed to sharing the cultural arts of his country and reaching people of different socia-cultural backgrounds through music.